One way to gauge a vehicle's long-term dependability is to survey owners of 3-year-old models that were purchased new and ask them to identify problems that have arisen during the previous 12 months. Understanding owner-reported quality problems is one of the many inputs that automakers around the world use to improve vehicle quality and long-term dependability, and this is precisely what J.D. 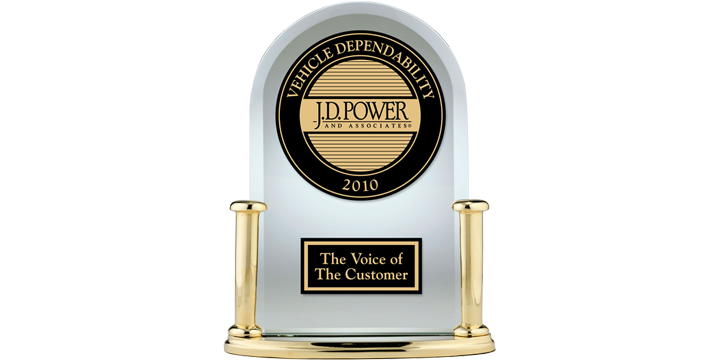 Power and Associates provides with its auto industry benchmark, the Vehicle Dependability Study (VDS). Unlike the J.D. Power Initial Quality StudySM (IQS), which measures owner satisfaction after 90 days of ownership (and is a gauge of how well a vehicle has been put together during assembly), for VDS, original owners are asked whether they have experienced problems in any of nearly 200 different problem areas. The resulting information-straight from those who own and drive a particular model-is invaluable to consumers who use the study findings to help them make more-informed choices when considering both new and used vehicles. Consumers aren't the only ones paying close attention to VDS results-manufacturers also take note, as the study helps them design and build better models in the future. According to the 2010 VDS, which measures problems experienced by original owners of 3-year-old (2007 model-year) vehicles, several long-term dependability trends have emerged. Among the key findings is that while long-term vehicle dependability continues to improve for the majority of automotive brands, for some brands owner perceptions have not kept pace with their vehicle's actual performance. Several brands that performed well in the 2010 Vehicle Dependability Study-including Cadillac, Ford, Hyundai, Lincoln, and Mercury-are still trying to shake a perceived quality stigma, even though the study results speak otherwise. All of those brands finished above the industry average. "Producing vehicles with world-class quality is just part of the battle for automakers; convincing consumers to believe in their quality is equally as important," said David Sargent, Vice President of Automotive Research at J.D. Power and Associates. "It takes considerable time to positively change consumer perceptions of quality and reliability-sometimes a decade or more-so it is vital for manufacturers to continually improve quality and also to convince consumers of these gains." The 2010 VDS also finds that owners are replacing fewer broken vehicle parts-or components-compared to last year's study. Vehicle dependability is directly related to component replacement, so the news will be welcome news to owners and consumers, who may incur lower maintenance and repair costs, and to manufacturers, which will benefit from reduced warranty expenses. Understandably, long-term dependability-the trend measured by VDS-has a strong effect on owners when they are considering whether or not to repurchase a vehicle from the same brand (known as "repurchase intent"). Owners who did not experience problems with their vehicles were much more likely to indicate that they would repurchase a vehicle of the same brand. Regardless of any individual preferences for sleek styling or fun driving dynamics, consumers still seek problem-free vehicles. Twenty-five of 36 brands have improved in long-term dependability in 2010, compared with their performance in 2009, which continues a steady trend of industry-wide improvement. Toyota continues to perform well in long-term dependability and garners four segment awards-more than any other nameplate in 2010 for this study-for the Highlander, Prius, Sequoia, and Tundra. Honda receives three segment awards for the CR-V, Fit, and Ridgeline. Lincoln captures two awards for the Mark LT and MKZ. In addition, Audi, BMW, Buick, Cadillac, Chevrolet, Ford, Lexus, Mazda, Mercedes-Benz, and Mercury each receive a model segment award. Among owners who say they did not experience problems with their vehicle, 43% indicate they "definitely will" repurchase their current brand. This figure declines to 28% among owners who say they experienced at least one problem with their vehicle. Due to a 38 PP100 improvement, Porsche moves up 10 rank positions from its performance in the 2009 study to rank highest among all nameplates in the 2010 study-which is consistent with the brand's performance in the 2007 Initial Quality Study. Lincoln, by way of a 30 PP100 improvement, moves up six rank positions from 2009 to follow Porsche in the nameplate rankings. Rounding out the top five nameplates are Buick, Lexus and Mercury. Seven of the 10 models with the lowest incidence of problems in the industry are from Ford and General Motors, including the 2007 model-year Buick LaCrosse, Buick Lucerne, Cadillac DTS, Ford Five Hundred, Lincoln MKZ, Mercury Milan, and Mercury Montego. Overall vehicle dependability has improved by 7% in 2010 to an average of 155 PP100, compared with 167 PP100 in 2009-a rate that is consistent with historical industry gains. The 2010 Vehicle Dependability Study is based on responses from more than 52,000 original owners of 2007 model-year vehicles. The study was fielded between October and December 2009. The study includes 198 different problem symptoms across all areas of the vehicle.